I’ve been saying this for awhile, but hey it’s true. Unique, vintage, one-of-a-kind things are the kind of things that give a room presence. Today I am going to show you an example. 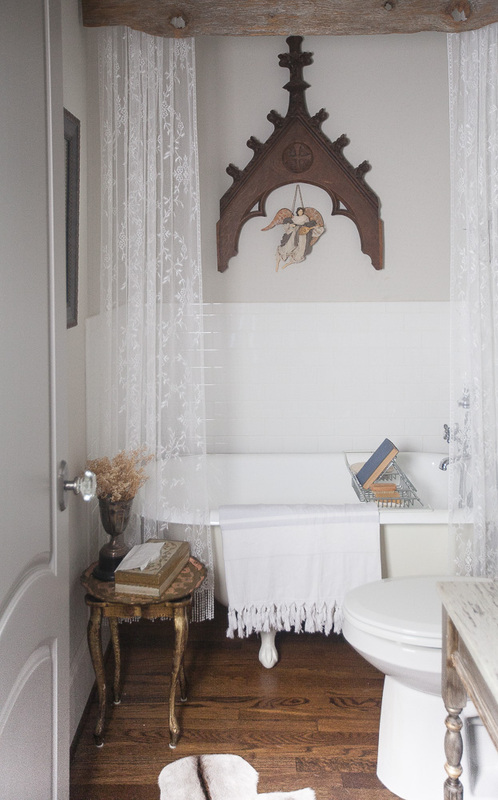 For one, the room is unique because of the barnwood I used for the shower curtain valance. I had a cool piece over the mirror too. Then as things tend to rotate in my house, I moved this artwork in here. It’s a Monet, clearly not an original. Then I found this amazing piece at Round Top. 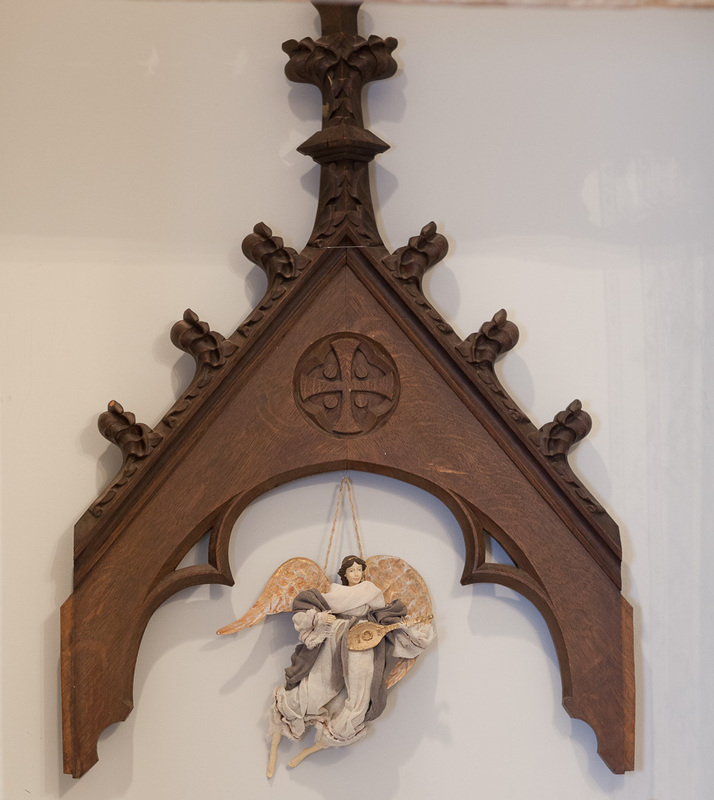 Likely it’s from a church, and I love old pieces from churches. It was sitting on the floor for a long time, because I just couldn’t figure out where I had room for it. Then I realized I did have a spot. 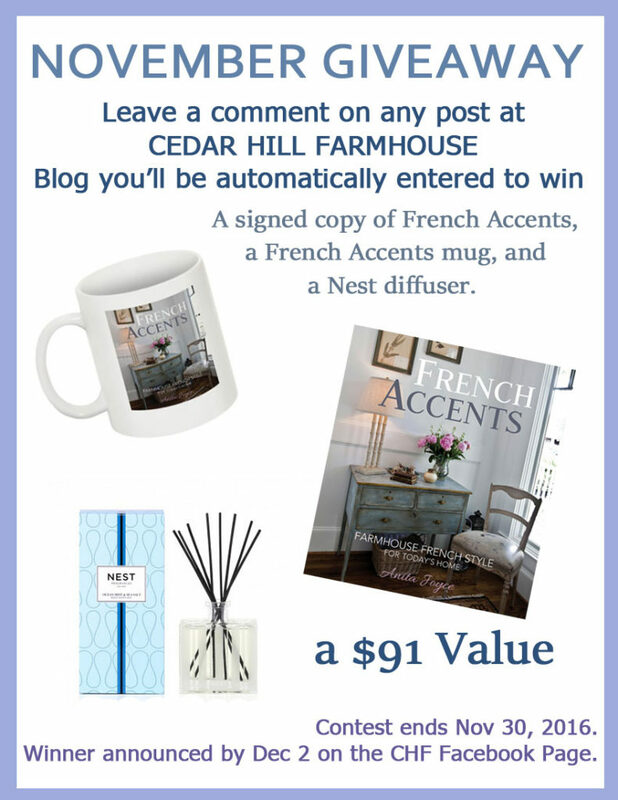 Remember every comment this month on any post at Cedar Hill Farmhouse blog automatically enters you to win. Legaleeze here. I’m not sure how it was used, but I bet there is a smart reader that does know. It’s very old and hand-carved. I was quite taken with it at Round Top and had to have it. So as you might have guessed, for now it is in the bath. I know, the bathroom may seem like an odd place, but I just don’t have the wall space in most of my house for this piece. Think of it as being over the baptismal if that helps. I love every detail on it. Well, I felt it looked a bit lonely so I added this charming angel. Isn’t she sweet? I say ‘she’ because as a kid I insisted that all angels were girls. This was an argument I had with my brother who clearly was NOT one. So the point of today is to look for unique items that speak to you. Your guests will go ‘wow’ when they see it, and you will be happy living with it. 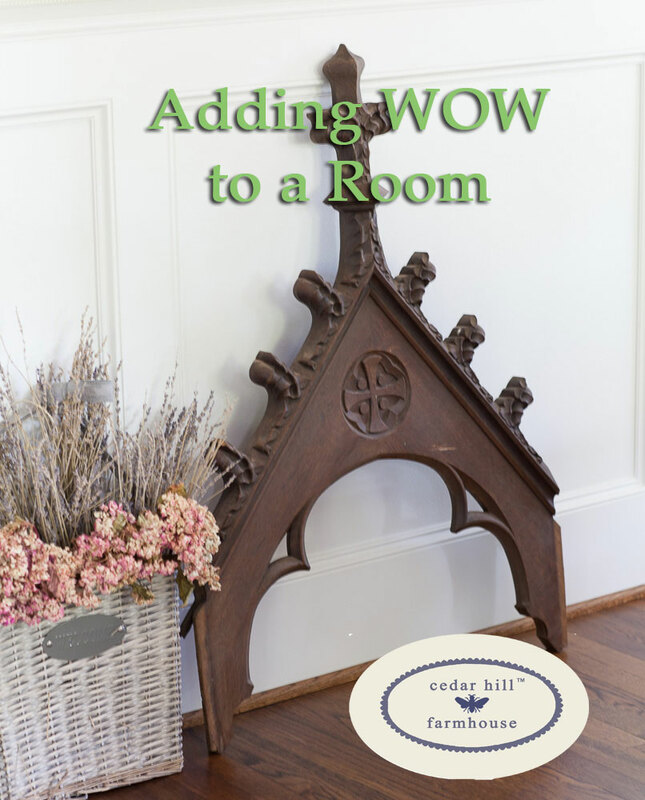 I like to have a ‘wow’ in every room for me and for my guests. That is the thing guests notice and remember well after they leave your house. I don’t suggest buying things just to impress people; I don’t do that. I do suggest you find things that make you go ‘wow’. Those things, you will probably keep for a very long time. The things you bought because they were popular you’ll get rid of soon enough. And there you have it. They really are just lace curtains Joyce. We don’t use this tub, so the curtains are for decorative purposes only. Love them. How do u hang them? The barn wood? I used L brackets. I did it myself, but it wasn’t easy. It is best to have two people on this job. What a lovely piece! It could well have been over part of the stations of the cross in a Roman Catholic church also or over the Holy Water basin as the congregants enter the sanctuary. Wouldn’t it be fun to know!! I recently started following your blog ,and though I decorate more transitional, I do enjoy your posts. This one especially. I too am drawn to old church pieces. I found an old hymn board that I hung up n our family room and display family photos in it. Everyone comments on it. Thanks for sharing. Your life story is inspirational. Blessings to you ! Wow, I am sure it is beautiful Linda!!! I agree.. love antiques, rustic pieces.. and of course barn wood! it.. thinking about a sofa table, but I love what you did! Have a great rest of the weekend. If you have small pieces of barnwood you could make a picture frame. A picture of the old barn or a painting of it in the frame would be lovely. How fun and fabulous is this?! I love this Anita. Also this bathroom is amazing!!!!!! Well done! I have no idea what that piece is but it looks amazing over the tub. I like how it ties in the wood valance hiding the shower rod. Love this piece. I like old wood pieces also. Ohhhhh Anita just love this. Just stunning. 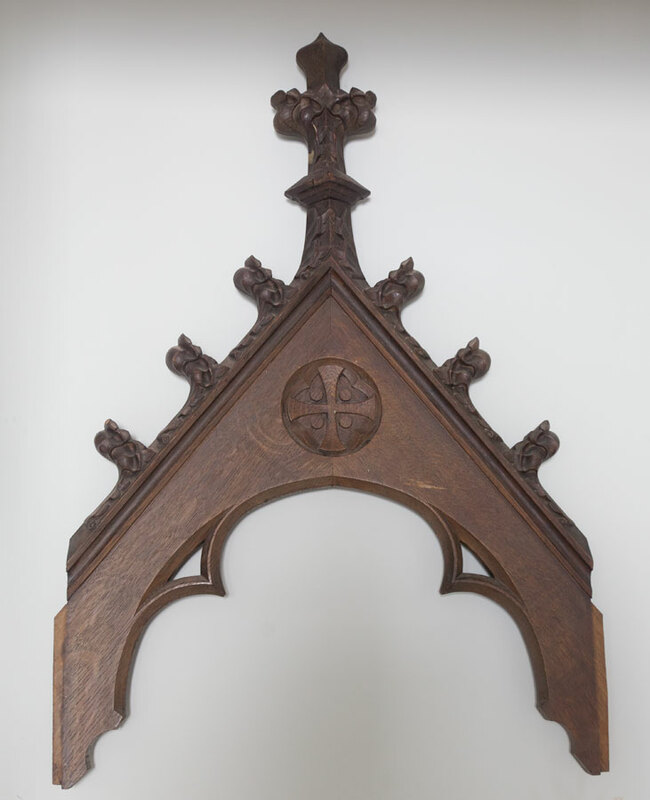 Anita, the piece reminds me of the wood casings often used to encase stained glass windows in churches of Gothic design. It appears to be only the top portion and missing the side and bottom pieces. Usually, stained glass windows positioned in the side walls of the nave were smaller and more narrow than the main altar and transept windows. Your piece in beautiful and a real treasure! and I agree “in stuff” comes and goes….this will be great forever. That is a beautiful piece, I think it was in a baptisim area of the church! It would be nice to hear exactly where it waslocated. I love this piece and its presence! You have made a fine display of honor, I like your baptismal thought. love the baptismal !! your whole hose “wows” me! thanks so much for your inspiration and giving spirit. always love to “visit” with you. Exquisite! I’m always on the hunt for those unique pieces too!!! What a lovely addition to any room but I think your choice of the bathroom is perfect. How do you prevent the shower splashings and soap to NOT get on the piece? Same with the “Monet?” A picture in a shower or anything that could be destroyed by water is not practical. It also could have come off a “confessional.” Stations of the Cross is another good answer. I’m hglad inking this is not a shower but only a bathtub. I had the same thought when I saw the Monet, real or not! I’m sorry about autocorrect. It was supposed to read I am thinking this is not a shower…. There is no shower in the tub, and the tub really isn’t used, since it is not near a bedroom. That’s easy Sherry. This tub isn’t used. It’s the downstairs bathroom, and we don’t have a downstairs bedroom, so we don’t use this tub. There isn’t a shower in here either. 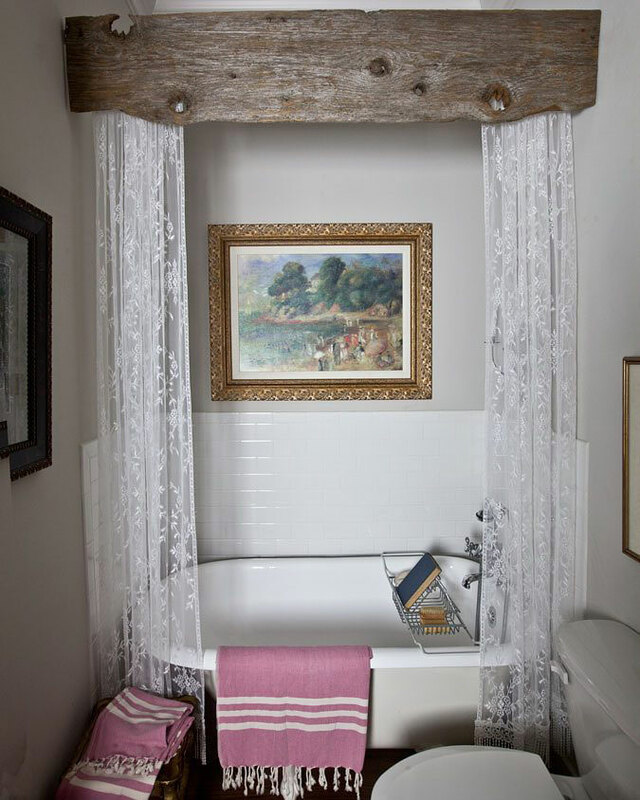 Love the driftwood over the shower curtain! Hi Anita. This is a beautiful piece. It looks like it may have topped one of the 14 Stations of the Cross from a Catholic church. The stations can be plaques or three-dimensional figures depicting Jesus’ journey to the cross. It looks quite large, so it could have come from a Cathedral. Very nice! I love the way your ideas inspire me to re-think my stuff!!! Thanks! WOW is right! I liked all the looks but the last is my favorite! Always looking for those kind of architectural pieces. Therected are some great stores in Chattanooga and Cleveland Tn…and pricing iS usually good … but a curb treasure is best . Thanks for sharing . Beautiful piece! I would love to have a hymnal number wooden display for the entryway of our home. Thanks for sharing. What a special and beautiful piece. I can see it being handed down and down, and the stories that will grow with it. I really like it on the floor. It has so much presence there. The piece may have been part of a baptismal font. Beautiful piece and love where you have it hung looks great! 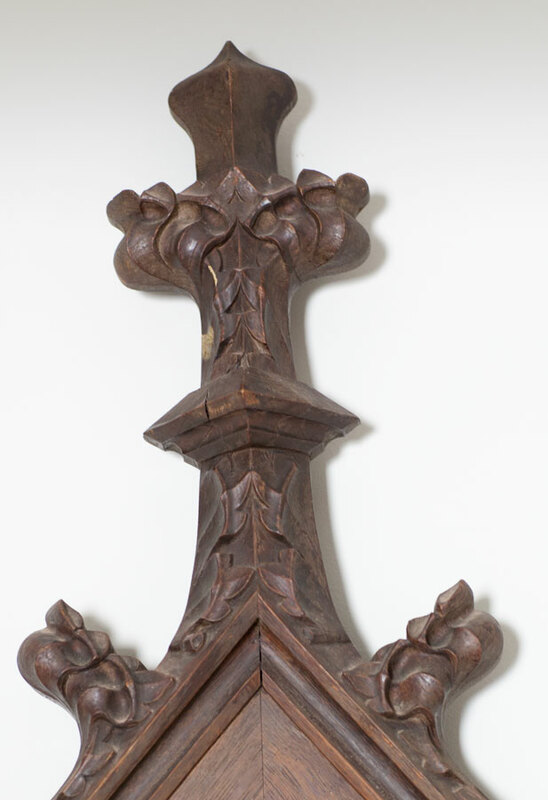 The beautifully carved wooden piece may be the top of a small side altar. Like you, if a piece spoke to me, I’d find a place for it. That is a perfect spot, cool bathrm too! The angel just finishes it off! It might have been part of the aumbry where consecrated wine and wafers are kept. 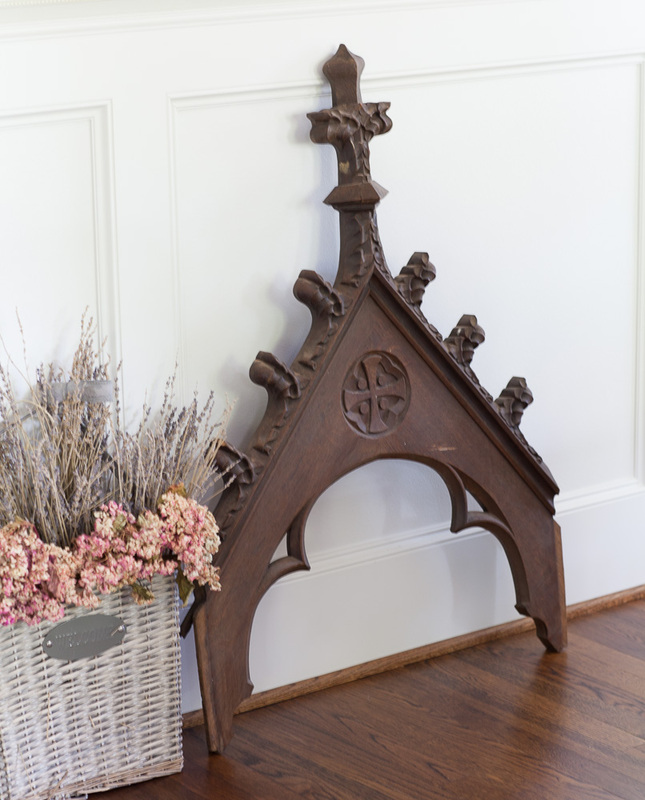 I just love old Church pieces and I would say that you have a real find. Hi Anita, Your brother was right, only male angels in the Bible. Most of the “female” angels we see represented in Medieval and later paintings are “beardless youths” not females. Don’t feel bad. Being an angel only means you are a messenger or performing some other type of service. It is not necessarily a reward for good behavior. None the less, I like your angel in the bathroom. Hope the humidity doesn’t damage him. I say it came from the stations of the cross also! Really beautiful! Lucky ? you! I love your piece and it works perfect in the bathroom. I love unusual pieces like yours. I have two ….thst I put over doorways. Love your style. Yes, very cool piece! I really, really love your idea to use barn wood for a valance. I could spend hours in that bathtub of yours!! Wow the church piece is stunning! I’m so glad you found it. It has taken me years to understand that it does take unique items (not just things you grab at HomeGoods) to make a home have character and warmth. What a special bathroom! I also love “church” items in decorating. One of my favorite items is a wood prayer kneeler that I bought at a Salvation Army almost 20 years ago. It is beautiful AND practical!! Your bathroom is beautiful. 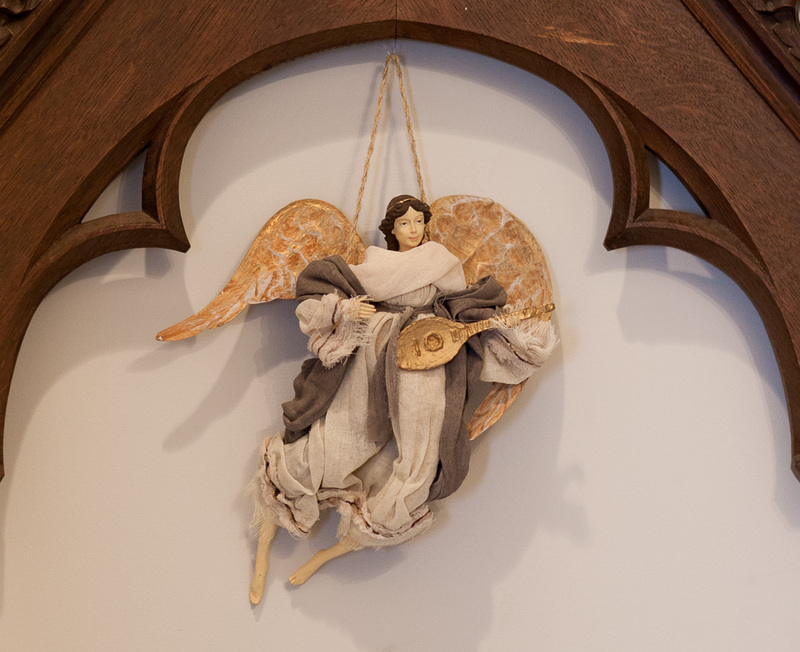 As for the thought of angels being female, I could certainly see why one would think so… they are often drawn with feminine faces, flowing hair, and without facial hair! The new old church piece is pretty. 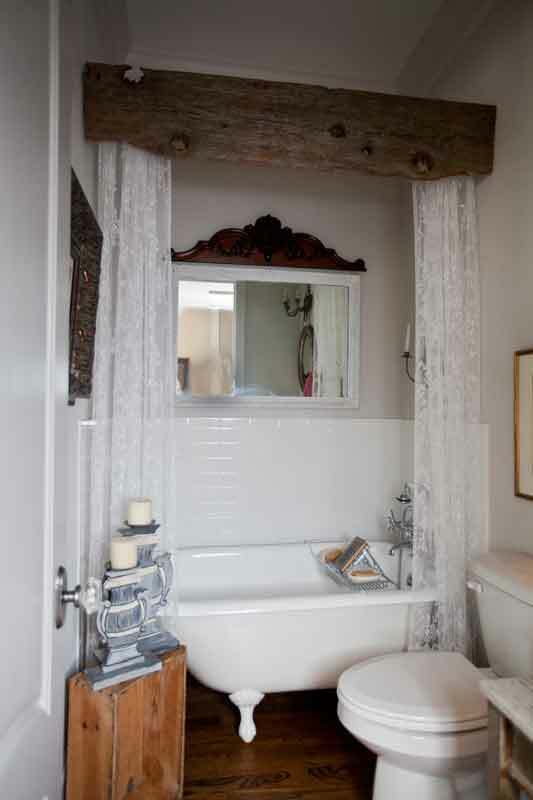 I love the combination of romantic and rustic in your bathroom, Anita – very homey. Love the hand-craved piece! It is beautiful! It seems perfect for the bath; the angel was a good choice to finish the look. I like it better in that spot than the mirror or the Monet. Anita, I really enjoy your side-bar personal journal-like comments! Thanks for sharing! Your blog reminds me to look for pieces I love when I go shopping. i really love your style of decorating. we are in the process of moving to Birmingham and the house we have chosen is more formal and traditional than i usually gravitate towards. can is still style this house in the French country theme?? This is a total wow piece! As soon as I saw it, I thought YES!! And then seeing it in the bathroom over the back wall of the tub, its just awesome. Good call! What a unique and beautiful piece that architectural piece is! And the angel just finished it perfectly. Lovely. Great idea, We also love to mix vintage and new items as old pieces definitely have more charm and a story than new items. Love, love, love. I get crazy giddy over unique pieces like this. The spot is perfect. This piece is beautiful Anita. 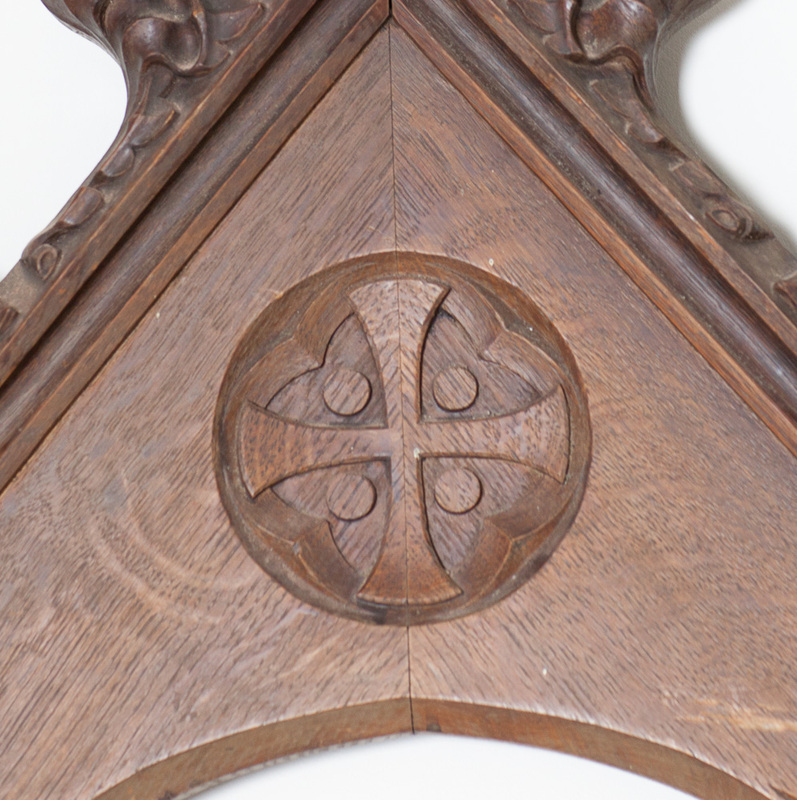 It may come from a Catholic Church or a piece from a old Cathedral mirror or Italian bed. My favourite – the barn wood valance! Tres unique. You pointed out something I never thought about, most angels figurines are female. The archangels are male and the men who visited Abraham might have been angels. Anyone interested in starting a business?.. Create make angels. Love your Blog. Read it every day. I too like to add “the unexpected” element in a room. It’s always a Wow! I would just hang out in this bathroom…love the uniqueness! Thank you for the encouragement to buy things that make me go WOW! I have a few pieces of antique furniture that I just love and get pleasure from them every time I look at them. They are my Wow pieces. I like the idea of having something like that in every room. Love these old, architectural pieces!! Love this bathroom! Moving and doing a bathroom kinda primitive. May have to borrow some of the design ideas from this bath. I have a couple of pieces that are unique and love that wow factor. I moved to Ohio from Houston, Texas about 13 years ago. Hate that I was so close to you and yet now so far. Don’t make it back very often but love you ideas and stories. We lived in the Heights and lived the area. Thanks for all your ideas and suggestions. Sorry I missed you Regina. You found the absolute perfect place for it!! I love unique items too and am always on the look out for one. Very hard to find anything unique any more around here anyway. The church piece is a great find!! You have a sharp eye!! What a wonderful find. I was worried about the wood in the bathroom until you explained. Thank you for more unspiration. Hi Anita I must say I read everything that you write about in every post . Sometimes I may leave a comment and some times I won’t. I also read all of the comments friends have to say. 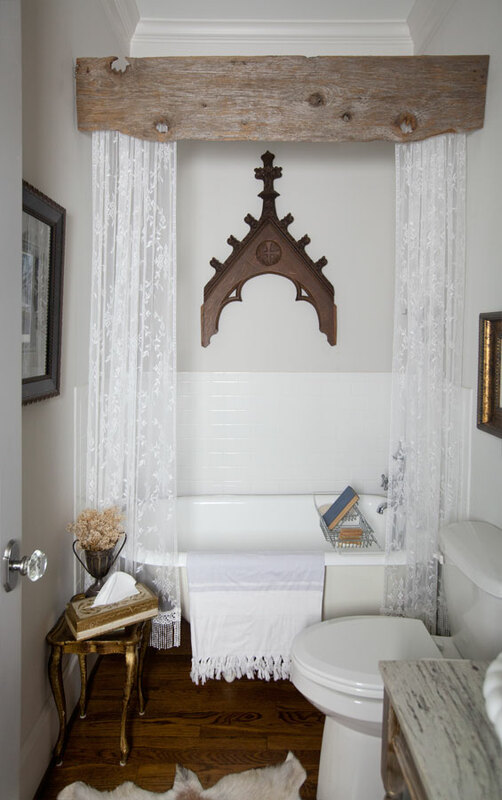 Now about this one first let me tell you that I love the barn wood over the tub and the curtains.It is beautiful but for the church piece well I’m a little skeptical only because it is [ a church piece] and it is a [bathroom] .I believe that it should be placed somewhere in the house where it is more…. should I say gracefully respected like the dining room near the table where one eats or the kitchen or may be in a bedroom. It is a beautiful piece and I like the angel underneath it but not the bathroom . Just my opinion though a friend for far away . Have a great day . I had the same thought, but… there was no place in those rooms where I could put it. So it went in here. I don’t think of it being disrespectful. I think of it as God being everywhere, even in lowly places. And if I couldn’t put it in here, I was going to have to sell it, because there truly was no other place it was going to work. And that is how it ended up in here. Thanks for your comment. I enjoy seeing your ideas. I love the church carving. I do not see many in my area, but I would love to find one. I have followed you for a while through Stonegable and have enjoyed listening to the podcasts. this is the first time I’ve commented. I appreciate your comment so much Janet!!! You are so sweet.